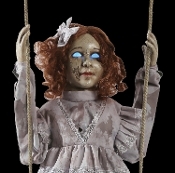 Deluxe Scary Hanging Animated Talking Vintage Style-SWINGING DECREPIT DOLL-Glowing Eyes Spooky Sound Effects Motion Activated Animatronics Creepy Halloween Haunted House Horror Prop Decoration - She just wants someone to play with and promises not to hurt you... Much! 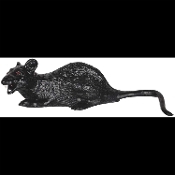 Amazing Realistic Animated Digital Special Effects WITCHING HOUR AtmosFEARfx Illusions FX DVD. 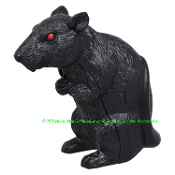 Make an incredible visit deep into a witch's lair, where bats, black cats and ravens toil thru the night! 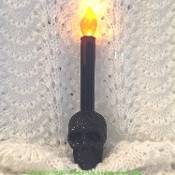 A cloaked enchantress brews magic spells, conjuring whimsical spirits. 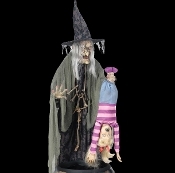 Huge Scary Life Size Standing Animated STEW BREW WITCH COOKING KID with FOG Lights Spooky Sounds Creepy Crone Torturing Child Victim Motion Activated Halloween Haunted House Horror Prop Deluxe Animatronics Decoration-Sinister potion’s secret ingredient is a small child! 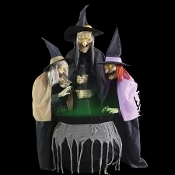 Deluxe Animated LIFE SIZE Talking Creepy STITCH WITCH SISTERS TRIO Scary Cackling Voices-Spooky Glowing Eyes-Bubbling Potion Lighted Cauldron-Three Spell Casting Crones-Halloween Haunted House Animatronics Prop Decoration-FIVE FEET TALL-See Video! 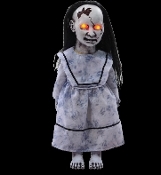 Scary Gothic LUNGING GRAVEYARD BABY Creepy Animated Halloween Haunted House Prop Decoration Zombie Doll with LED Lights includes Eerie Sounds, Printed Soiled Blanky, IR Sensor, TRY ME Step Here Foot Pad. Soft PVC Head, Hands and Feet. 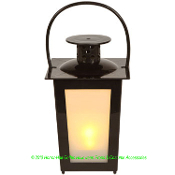 Choose Battery operated or Adapter Plug. 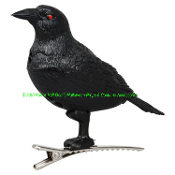 Plastic animated flying black bat toy with fabric wings and lifelike movement is a great prop for your haunted scene! 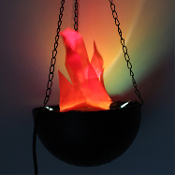 Then turn it on and the eyes light up and it will flap its wings, continuously flying in smooth circles for you. 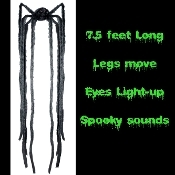 Nearly 3-Feet wide! You've heard of man's best friend, but when you meet this barking Walking Dead inspired canine zombie skeleton attack guard dog you will surely not feel loved. 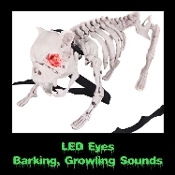 Noise sets off his vicious barking, growling, snarling and fiercely flashing glowing eyes timed to his barks. 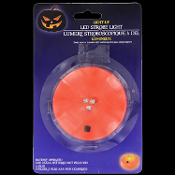 STEP HERE PAD SWITCH ACCESSORY Activates Animated Animatronic-for Battery or Electronic Props Display-Halloween Haunted House Decorations with Standard Mini Jack Connector - Pressure activated optional operation when sound activation is deterred by noise interference. 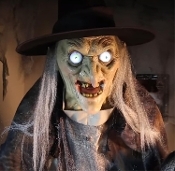 New Creepy Life Size Animated Evil HELGA WICKED WITCH GYPSY FORTUNE TELLER with Spooky CRYSTAL BALL Scary Haunted House Talking Halloween Horror Prop Haunt Decoration. 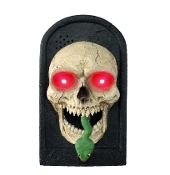 Gothic Speaking Hag Deluxe Greeter Lighted Sound Motion Activated Cackling Sorceress Animatronics Decor. 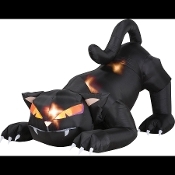 New Creepy Life Size Animated Light Voice Evil MATILDA WICKED WITCH with Scary BLACK CAT Spooky Haunted House Talking Halloween Horror Prop Haunt Decoration. 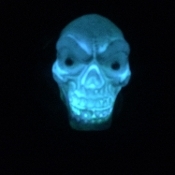 Gothic Speaking Hag Deluxe Greeter Lighted Sound Motion Activated Cackling Sorceress Animatronics Display Decor.